I would be lying if I told you I didn’t have a hair trial before my wedding. It was something that was important to me so I could visualise the overall look and to ensure I would feel comfortable on my big day. But hair trials aren’t for everyone – many brides are unable to book a hair trial for a number of reasons. Lack of time, budget restrictions and logistics – think destination weddings in another country or on an exotic island. And other brides just might not feel the need to. It’s a personal decision and will depend on your circumstances and what you feel comfortable with. If you are planning a local wedding and you will be using your regular hairdresser or hairstylist, you may not feel its necessary to book a trial. If so, have confidence knowing that your regular stylist will have a good understanding of you, your vision, your hair type and face shape. If you are planning a destination wedding, your wedding day hairstyle is really important – perhaps consider choosing a less complex hairstyle for peace of mind. Perhaps a beautiful blow wave, loose curls or even a simple bun to suit the venue and location of your wedding. Find inspiration images of hairstyles you love. Browse Pinterest or wedding magazines and gather hairstyles that you think will suit you, your hair type and bridal look. It’s best to find a few different styles to choose from in case your favourite style doesn’t work with your hair type, length or face shape. Either via email or over the phone well before your wedding day. Send through your inspiration images and also information about your hair length, texture, thickness and face shape. This will help your hairstylist get a better understanding of who you are, your vision and what they will be working with on the day. Browse your hairstylist’s portfolio to see if they have created similar styles for past brides. Otherwise, ask your hairstylist whether they have had much experience with this style and whether they think it will work with your hair type/length. If you have thin medium length hair, a Kim K hairstyle will just disappoint you. If you have naturally straight hair that won’t hold a curl, opt for hairstyles that won’t require lots of tight curls. Factor in additional time on the day so your hairstylist will have time to make adjustments. If you normally wear your hair up, a down-style with your hair over your shoulders might get in the way. The aim is for you to look your best but also to feel as comfortable as possible so pick a hairstyle that reflects you. A happy and comfortable bride is a beautiful bride! If you are planning to wear accessories in your hair, be sure to tell your hairstylist so they can plan for it. 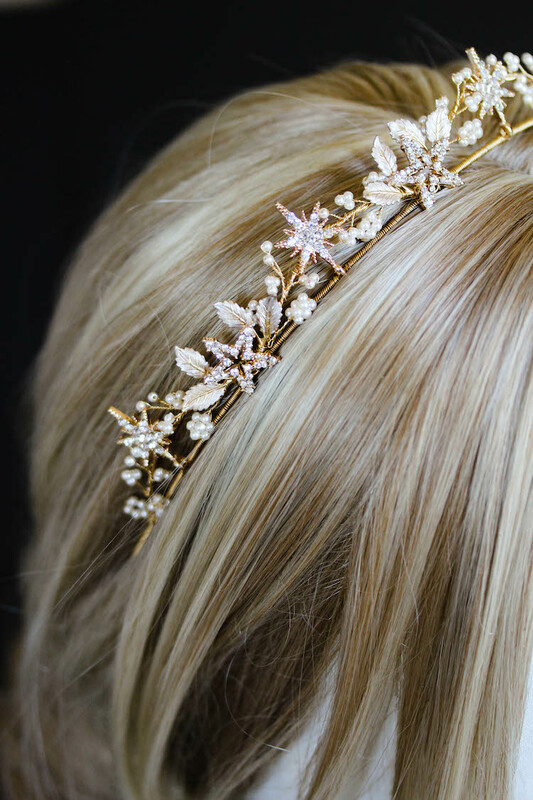 Chat to your accessories designer to ensure the headpiece and fastener is suitable for your chosen hairstyle. They should be able to recommend a comb, clip or another attachment that will best suit your hairstyle and hair type. Ensure your chosen hairstyle will support the weight of your headpiece. Most headpieces are lightweight however elaborate bridal hats or metal-based headpieces will need to be well supported. If you are planning to wear a headpiece or veil, practice wearing it around the house. It’s a bit like wearing in your new wedding shoes! Your best bet is to communicate with your hairstylist before the big day. Get a feel for their personality and their working style. They will want to come prepared as best they can so they can bring your vision to life. Are you having a hair trial before your wedding day? How essential is a hair trial for your wedding day preparation?